Happy Sunday! Today's video is up along side my tip of the week which is: Always push yourself to try new things, be it new recipes and foods, new makeup styles and travels. This week I've been pushing myself to work harder, try new things out with my organisational habits and foods. I want to be a lot more punctual and carry on trying my best, but every once in a while you need a bit of variation. 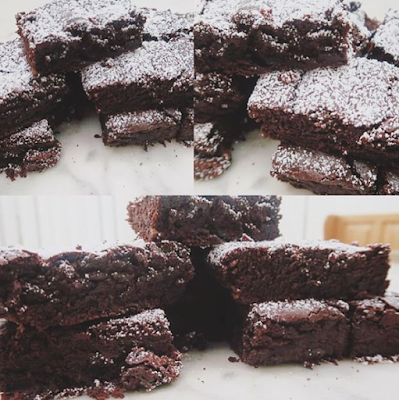 I've been so bad on Instagram this month, however after posting this picture (left) of my homemade chocolate brownies, I got loads of questions asking how I made them. Lucky for you I have posted the recipe right here on my blog. Click here to learn how you can make them yourself. The recipe is super simple and takes 10 minutes to make and 20-25 minutes to cook. They are completely vegan and can easily be gluten free depending on what flour you choose to use. I hope you've enjoyed this month's videos, if you haven't subscribed to my channel, make sure you do to stay up to date with The Life of Rosie.